If you need a straightforward, experienced attorney in the Western South Dakota area, do not hesitate to contact Matt Kinney or Kim de Hueck of Kinney Law, pc. With more than 19 years of experience, Matt and his associate Kim can provide both aggressive criminal defense and effective representation in personal injury claims. With a proven track record of success in a variety of practice areas, clients trust our law firm to successfully litigate even the most challenging of cases. It is our goal to move our clients toward a successful resolution in the most efficient manner through thorough investigation, detailed preparation and an unwavering dedication to our clients' best interests. 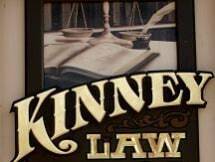 Kinney Law, pc, in Spearfish, South Dakota, represents clients located throughout South Dakota, including Western South Dakota, the Black Hills area and the communities of Rapid City, Spearfish, Sturgis, Deadwood, Belle Fourche, Buffalo, Lemmon, Custer and Hot Springs. Look to us for aggressive criminal defense to protect your freedom and limit your exposure to consequences. DUI charges can carry significant, long-term consequences. Trust our firm to fight to protect your driving privileges. If you or a loved one was injured in an accident caused by the negligence of another driver, call Kinney Law, pc, for help. Learn more about our founding attorney's education, experience and accomplishments. Learn more about the firm's history through our published cases.